Bought 3 dz women’s soft duo matte finish . Senior golfer 9-10 handicap average driver 225ish . This is the longest ball I’ve ever played 10 yards gained. Like the looks of the matte finish and blue logo but it may dirty up easier that most . It’s in my bag for this year . 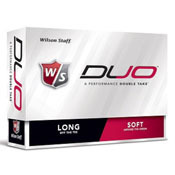 Twice I had a Wilson Staff Duo golf ball split during play. The first time was a tee shot to a short (130 yds) par 3 using a PW. To the balls credit, it landed on the green, although it flew like a wounded duck. The second time, was on a tee shot using my 8.5 degree driver. The ball should have traveled about 250 yds in the air, but it only went 178 yds, according to my garmin gps. I estimate this ball has a high likely hood of splitting after 100 hard shots. I like the ball but have had 2 occasions where the ball split, I think the core splits first then the cover,because of erratic flight before I see the split. Send email to Wilson and received minimal response. Found the Wilson Duo on the golf course while playing. Put it in the golf bag and forgot about it. On Saturday I decided to put the ball in play for the first time and was pleasantly surprised. Started driving the ball thirty yards farther and straighter then the ball I currently play. It was also soft around the green. Unfortunately I lost the ball when I overshot the green on the sixteenth green and it went into the deep rough behind the green. The yellow ball should be a lot brighter than the one that is play today. Titliest, Taylor Made. Srixon and Bridgestone. Wasn't sure that a two-piece ball would deliver spin with distance. But the Duo is aptly named. It's as long as any other ball I've used - 3-piece, even a few expensive 4-piece balls; and it stopped very quickly on the greens. Plus putting - very soft roll. Titlest PV-1, Nike Vapor, Bridgestone, etc. Bought my husband some of these for Christmas, anyone else ever have one explode and split in half? He did yesterday... But he said he likes them otherwise. This has become the ball of choice for this senior player. Seems to go straighter and a little longer. It even puts a little backspin on the wedges. Putts well on the green. Seems to work well at all distances. I tend to use my old Bullseye putter as a gauge to how a ball performs/feels. Let me tell you this ball just pings off the face, excellent feel too. At the price the best ball of its kind by a country mile! I was on Facebook one day when a golf buddy of mine who lives in Florida told me to go buy a dozen of Wilson golf balls. I told him I would give it a try. So this past weekend I gave them a try. It was a cool 49 degrees here in Georgia when I started the round but I must have warmed up while playing with the Wilson Duo. So for my first round of the year I shot a 79 with a triple on the last hole! (It got dark & colder & I couldn't feel my hands on the last hole.) But I must say that the Wilson ball feels so great to me that I'm returning 4 dozens of Srixon Q Star & Strixon Q Star XV & one dozen of Titleist Pro V1 X! This is now my new ball of choice. The last time that I was this excited about a golf ball was when the Maxfli Revolution hit the scene and the 2011 Pro V1 X. This ball is long and soft! It feels so great while putting on the greens and it's a very stable ball. It holds the line as well as the Pro V1X. I have good control with distance control on approach shots, chipping, & pitching. And for only $20 it's the best deal on the market. What do you have to lose? Give it a try just as my buddy told me. You will be glad that you did it. Happy golf season my friends and keep it on the greens! Almost every premium ball on the market!